This article is about the part of the eye. For other uses, see Iris (disambiguation). In humans and most mammals and birds, the iris (plural: irides or irises) is a thin, circular structure in the eye, responsible for controlling the diameter and size of the pupil and thus the amount of light reaching the retina. Eye color is defined by that of the iris. In optical terms, the pupil is the eye's aperture, while the iris is the diaphragm. The iris in humans is the colored (typically blue, green, or brown) area, with the pupil (the circular black spot) in its center, and surrounded by the white sclera. The iris consists of two layers: the front pigmented fibrovascular layer known as a stroma and, beneath the stroma, pigmented epithelial cells. The stroma connects to a sphincter muscle (sphincter pupillae), which contracts the pupil in a circular motion, and a set of dilator muscles (dilator pupillae) which pull the iris radially to enlarge the pupil, pulling it in folds. The circle circumference sphincter constricting muscle is the opposing muscle of the circle-radius dilator muscle. The iris inner smaller circle-circumference changes size when constricting or dilating. The iris outer larger circle-circumference does not change size. The constricting muscle is located on the iris inner smaller circle-circumference. The back surface is covered by a heavily pigmented epithelial layer that is two cells thick (the iris pigment epithelium), but the front surface has no epithelium. This anterior surface projects as the dilator muscles. 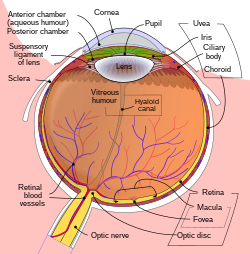 The high pigment content blocks light from passing through the iris to the retina, restricting it to the pupil. The outer edge of the iris, known as the root, is attached to the sclera and the anterior ciliary body. The iris and ciliary body together are known as the anterior uvea. Just in front of the root of the iris is the region referred to as the trabecular meshwork, through which the aqueous humour constantly drains out of the eye, with the result that diseases of the iris often have important effects on intraocular pressure and indirectly on vision. 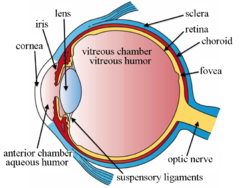 The iris along with the anterior ciliary body provide a secondary pathway for aqueous humour to drain from the eye. The collarette is the thickest region of the iris, separating the pupillary portion from the ciliary portion. The collarette is a vestige of the coating of the embryonic pupil. It is typically defined as the region where the sphincter muscle and dilator muscle overlap. Radial ridges extend from the periphery to the pupillary zone, to supply the iris with blood vessels. The root of the iris is the thinnest and most peripheral. The muscle cells of the iris are smooth muscle in mammals and amphibians, but are striated muscle in reptiles (including birds). Many fish have neither, and, as a result, their irides are unable to dilate and contract, so that the pupil always remains of a fixed size. The midway between the collarette and the origin of the iris. These folds result from changes in the surface of the iris as it dilates. Crypts on the base of the iris are additional openings that can be observed close to the outermost part of the ciliary portion of the iris. The structural folds of Schwalbe are radial folds extending from the border of the ciliary and pupillary zones that are much broader and more widely spaced, continuous with the "valleys" between the ciliary processes. Some of the circular contraction folds are a fine series of ridges that run near the pupillary margin and vary in thickness of the iris pigment epithelium; others are in ciliary portion of iris. Anterior chamber cross-section imaged by an SD-OCT. The stroma and the anterior border layer of the iris are derived from the neural crest, and behind the stroma of the iris, the sphincter pupillae and dilator pupillae muscles as well as the iris epithelium develop from optic cup neuroectoderm. The iris is usually strongly pigmented, with the color typically ranging between brown, hazel, green, gray, or blue. Occasionally, the color of the iris is due to a lack of pigmentation, as in the pinkish-white of oculo-cutaneous albinism, or to obscuration of its pigment by blood vessels, as in the red of an abnormally vascularised iris. Despite the wide range of colors, the only pigment that contributes substantially to normal human iris color is the dark pigment melanin. The quantity of melanin pigment in the iris is one factor in determining the phenotypic eye color of a person. Structurally, this huge molecule is only slightly different from its equivalent found in skin and hair. Iris color is due to variable amounts of eumelanin (brown/black melanins) and pheomelanin (red/yellow melanins) produced by melanocytes. More of the former is found in brown-eyed people and of the latter in blue and green-eyed people. Iris color is a highly complex phenomenon consisting of the combined effects of texture, pigmentation, fibrous tissue and blood vessels within the iris stroma, which together make up an individual's epigenetic constitution in this context. A person's "eye color" is actually the color of one's iris, the cornea being transparent and the white sclera entirely outside the area of interest. Adult male with amber colored eyes. This color is extremely rare and occurs when there is an unusually stronger presence of the yellow pigment (lipochrome) in the iris & a rather small amount of brown pigment (melanin). This gives the eye an orange copper/gold hue. Melanin is yellowish-brown to dark brown in the stromal pigment cells, and black in the iris pigment epithelium, which lies in a thin but very opaque layer across the back of the iris. Most human irises also show a condensation of the brownish stromal melanin in the thin anterior border layer, which by its position has an overt influence on the overall color. The degree of dispersion of the melanin, which is in subcellular bundles called melanosomes, has some influence on the observed color, but melanosomes in the iris of humans and other vertebrates are not mobile, and the degree of pigment dispersion cannot be reversed. Abnormal clumping of melanosomes does occur in disease and may lead to irreversible changes in iris color (see heterochromia, below). Colors other than brown or black are due to selective reflection and absorption from the other stromal components. Sometimes lipofuscin, a yellow "wear and tear" pigment, also enters into the visible eye color, especially in aged or diseased green eyes. The optical mechanisms by which the non-pigmented stromal components influence eye color are complex, and many erroneous statements exist in the literature. Simple selective absorption and reflection by biological molecules (hemoglobin in the blood vessels, collagen in the vessel and stroma) is the most important element. Rayleigh scattering and Tyndall scattering, (which also happen in the sky) and diffraction also occur. Raman scattering, and constructive interference, as in the feathers of birds, do not contribute to the color of the human eye, but interference phenomena are important in the brilliantly colored iris pigment cells (iridophores) in many animals. Interference effects can occur at both molecular and light microscopic scales, and are often associated (in melanin-bearing cells) with quasi-crystalline formations which enhance the optical effects. Interference is recognised by characteristic dependence of color on the angle of view, as seen in eyespots of some butterfly wings, although the chemical components remain the same. White babies are usually born blue-eyed since there is no pigment in the stroma, and their eyes appear blue due to scattering and selective absorption from the posterior epithelium. If melanin is deposited substantially, there will be brown or black color, if not, they will remain blue or gray. All the contributing factors towards eye color and its variation are not fully understood. Autosomal recessive/dominant traits in iris color are inherent in other species but coloration can follow a different pattern. Amber colored eyes are extremely rare in humans. They consist of a solid orange/gold color that may contain lighter shades of the same pigment within the iris. This is an unusual occurrence that happens when the yellow pigment called pheomelanin (also known as lipochrome), is dominant within the iris. Pheomelanin is also found on individuals with green eyes in much smaller amounts. This is because green eyes have a strong presence of both melanin and pheomelanin. Often in poor lighting, one may mistake amber eyes for brown. This also happens when viewed from far away or in pictures with poor lighting as well. However, in natural or well lit areas, it is very easy to tell the difference between the two colors. Another common mistake people make is referring to amber eyes as hazel. Although similar, hazel eyes have a stronger presence of melanin with two very distinct colors within the iris (usually green/brown) and often contain many speckles or blotches of mixed hues. Heterochromia (also known as a heterochromia iridis or heterochromia iridum) is an ocular condition in which one iris is a different color from the other iris (complete heterochromia), or where the part of one iris is a different color from the remainder (partial heterochromia or sectoral heterochromia). Uncommon in humans, it is often an indicator of ocular disease, such as chronic iritis or diffuse iris melanoma, but may also occur as a normal variant. Sectors or patches of strikingly different colors in the same iris are less common. Alexander the Great and Anastasios the First were dubbed dikoro*s (dikoros, "with two pupils") for their patent heterochromias. In their case, this was not a true dicoria (two pupils in the same iris). Real polycoria can be due to disease but is most often due to previous trauma or surgery. In contrast, heterochromia and variegated iris patterns are common in veterinary practice. Siberian Huskies show heterochromia, possibly analogous to the genetically-determined Waardenburg syndrome of humans. Some white cat fancies (e.g., white Turkish Angora or white Turkish van cats) may show striking heterochromia, with the most common pattern being one uniformly blue, the other copper, orange, yellow or green. Striking variation within the same iris is also common in some animals, and is the norm in some species. Several herding breeds, particularly those with a blue merle coat color (such as Australian Shepherds and Border Collies) may show well-defined blue areas within a brown iris as well as separate blue and darker eyes. Some horses (usually within the white, spotted, palomino or cremello groups of breeds) may show amber, brown, white and blue all within the same eye, without any sign of eye disease. Iridology (also known as iridodiagnosis) is an alternative medicine technique whose proponents believe that patterns, colors and other characteristics of the iris can be examined to determine information about a patient's systemic health. Practitioners match their observations to iris charts which divide the iris into zones corresponding to specific parts of the human body. Iridologists see the eyes as "windows" into the body's state of health. Iridology is not supported by quality research studies and is considered pseudoscience by the majority of medical practitioners and eye care professionals. The word iris is derived from the Greek goddess of the rainbow, because of the many colours of the iris. ^ Romer, Alfred Sherwood; Parsons, Thomas S. (1977). The Vertebrate Body. Philadelphia, PA: Holt-Saunders International. p. 462. ISBN 0-03-910284-X. ^ Novella, Steven. "Iridology". Science-Based Medicine. Science-Based Medicine. Retrieved 20 August 2017. ^ Ernst E (January 2000). "Iridology: not useful and potentially harmful". Arch. Ophthalmol. 118 (1): 120–1. doi:10.1001/archopht.118.1.120. PMID 10636425. Wikimedia Commons has media related to Iris (eye).